This is the first in a 2 part series documenting my thoughts about the stunning city of Santiago de Chile, where I recently spent Spring Break learning about Copper, Che Guevara and Salsa dancing! The city of Santiago de Chile is a wonderful, wonderful place, which incorporates urban design features from Spain, London and New York. Santiago’s location in the southern subduction zone of the Andean Volcanic Belt may leave it vulnerable to major earthquakes such as the magnitude 8.8 earthquake that devastated much of the region in 2010, but it also gives the city fantastically fertile soil and an unreal backdrop of the Andes mountains. It is appropriate that a geographic feature should shape a city so defined by its proximity to nature, although the Mapocho River is much less impressive than the Andes. In a similar fashion to London’s development along the banks of the Thames, Santiago’s most influential neighborhoods have emerged in close proximity to the Mapocho. The South Bank of the river is home to many government institutions including the country’s seat of power, La Moneda, as well as the city’s main commercial and retail powerhouses. The Northern bank neighborhood of Bellavista offers an intriguing parallel with London’s South Bank, New York’s Brooklyn or East Berlin’s Kreuzberg: a once destitute area home to those unable to afford the more affluent neighborhoods has attracted a number of young creative-types drawn by the low cost of living, and has developed a very bohemian culture which has thrived on the counter-culture energy of its young inhabitants. Bellavista is home to much of the exciting nightlife in Santiago, with small salsa bars and karaoke joints standing side by side with five-story clubs that host some of the worlds most famous DJs. The Mapocho acts as the city’s spine, and the Government has done an excellent job of developing a transport network that allows city dwellers to traverse the spine and other parts of the city in relative ease. The Costanera Norte Highway allows for efficient commuting without being an eyesore, with trees lining the road and a generous green pedestrian thoroughfare bordering the river, giving the intrinsic pleasure of walking through a park by the side of the river back to the people. I walked along the riverbank each evening around sunset, basking in the beauty to be found at the center of the city. Santiago’s residents similarly seemed to appreciate this simple urban design feature, with countless joggers, cyclists and dog walkers using the path, with groups of students and couples populating the grassy areas. 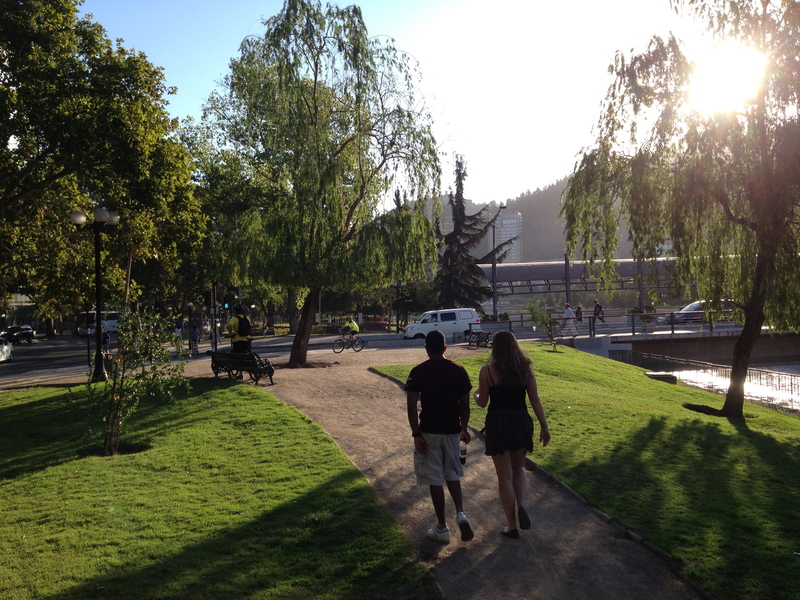 It struck me that green “paths” such as this Chilean urban design or The High Line in New York are often more popular than traditional parks with forests and meadows. This might be because these green areas are integrated with the city, rather than isolated from it: people visit Central Park or Hyde Park to escape the city, but people walk The High Line to embrace it’s urban setting. Furthermore, people can enjoy green pathways even if their motive for using it is to get from point A to point B, while a visit to a park requires a visitor to have an active motivation to visit a green space. Therefore, green pathways expose the benefits of a park – fresh air, open space and a pleasant natural aesthetic – to the entire city, rather than only those who actively seek them. Beneath the highway and the river lies Santiago’s impressive subway system, which rivals any system in the world I have used for convenience, price and quality. A flat rate fare of 610 pesos (85 pence or $1.29) on your Bip! card (just as good as an Oyster card, but with a better name!) gives you access to the entire city, and the modern trains run every 3 to 4 minutes, with a stop located every 7 or 8 blocks in the city center. The Santiago system is even more technologically developed than many of its Western counterparts, with public Wi-Fi available at all the underground stations. My one excursion on a bus left me pleasantly surprised as I discovered Santiago also offers a free transfer system similar to New York. Santiago’s public transport system is extremely popular as a result of its affordability, efficiency and comfort, and does an excellent job in reducing congestion, which is often one of the biggest problems in rapidly developing metropolises. My one minor grievance was that the Metro closed at 11pm, at which point in Santiago many people are only just finishing dinner, and if they could just extend the hours until midnight I wouldn’t be able to fault the system. Architecturally, Santiago has 3 distinct flavors: the old Spanish Colonial architecture of the Cathedral, the Opera and many other important historic buildings; the grubby and rather ugly high-rises constructed during the 60’s, 70’s and 80’s to cope with Santiago’s rapid population growth; and the gleaming towers of glass which are now being constructed to reflect Santiago’s status as a Latin American powerhouse and global business hub. 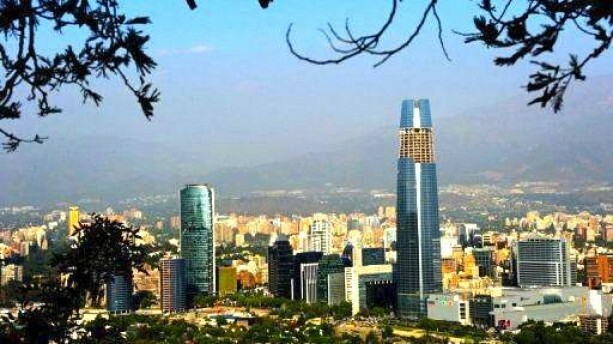 The neighborhood that is being developed to the North East of the city center, affectionately named “Sanhattan” in homage to the American island of skyscrapers, should make the world sit up and pay attention to Chile’s arrival on the world scene. A stunning complex of skyscrapers, Sanhattan is home to Santiago’s financial district and is surrounded by luxurious hotels and high-end restaurants. Walking through the neighborhood, I felt as though I was in an even shinier equivalent of Canary Wharf in London. Rising from the 20 and 30 story buildings is the Gran Torre Santiago, already the tallest building in Latin America whose design is somewhere in-between Freedom Tower in New York and The Shard in London – 2 of the most critically acclaimed and architecturally significant constructions in the West in the past 10 years. For a Chilean project to be mentioned in the same breath as London and New York’s centerpiece edifices is a testament to Chile’s development and a should act as a warning sign to many cities in the Northern hemisphere who may only look at their Northern neighbors and think themselves untouchable. While it is clear that Santiago is still an emerging city, and that I generally only confined myself to the more developed areas as a precaution, I have nothing but praise for Santiago as a city. While many urban planners look to New York as a model for urban development, much can be learned from Santiago, which maintains the density of a major city without compromising the value of public spaces. I personally fell in love with the city that is so defined by its geography, and would list it along with Berlin and New York as the only two places I have visited outside the UK that I could envisage myself living in. If you ever get a chance to visit Latin America I strongly, strongly urge you to visit Santiago. It may not be as ancient as Machu Picchu or as much of a fiesta as Rio, but I am certain you will fall in love with the Andean outpost that is at the very heart of all things Chilean.